American engineer military spaceflight engineer astronaut, 1979-1986. Status: Inactive; Active 1979-1986. Born: 1949-09-10. Birth Place: Garden City, New York. Bachelor of science in physics from Virginia Military College, 1971. Master of science in engineering physics from U. S. Air Force Institute of Technology, Wright-Patterson AFB, Ohio, 1976 . Stationed in the Pentagon. Later he joined Hughes Space and Communications, El Segundo, California. Family: Astronaut. Country: USA. Flights: STS-41-E, STS-62-A. Agency: USAF. Bibliography: 4452. 1949 September 10 - . Birth of John Brett Watterson - . Nation: USA. Related Persons: Watterson. 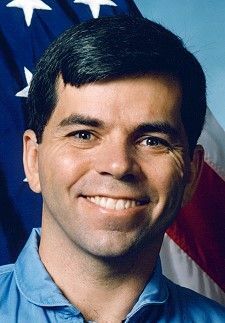 American engineer military spaceflight engineer astronaut, 1979-1986..
1979 August 1 - . DoD Astronaut Training Group 1 selected. - . Nation: USA. Related Persons: Casserino, Detroye, Hamel, Higbee, Joseph, Lydon, Payton, Rij, Sefchek, Sundberg, Vidrine, Watterson, Wright, Keith. The group was selected to provide shuttle manned spaceflight engineers to operate military payloads.. Qualifications: USAF, Navy, or Army officers with bachelor's degree in science or engineering; four years experience in flying or space-related activities. Vision minimum 20/150 uncorrected, correctable to 20/20. Maximum sitting blood pressure of 140/90. Height between 150 and 193 cm.. 13 were selected from 222 candidates. The existence of the group was secret until 1985. STS-41-E (cancelled) - . Crew: Buchli, Detroye, Mattingly, Onizuka, Shriver. Backup Crew: Sundberg. Support Crew: Watterson. Payload: DoD Mission. Nation: USA. Program: STS. Flight: STS-41-E. Spacecraft Bus: Shuttle. Spacecraft: Challenger. Planned Department of Defense shuttle mission. Cancelled due to IUS failure..
STS-62-A (cancelled) - . Crew: Aldridge, Crippen, Gardner, Gardner, Guy, Mullane, Ross, Watterson. Backup Crew: Odle. Payload: DoD Mission. Nation: USA. Program: STS. Flight: STS-62-A. Spacecraft Bus: Shuttle. Spacecraft: Discovery. Planned Department of Defense shuttle mission. Cancelled after Challenger disaster. Would have been first launch from the ill-fated SLC-6 launch site at Vandenberg, California..